Qatar announces easier entry for cruise passengers as 32 ships head to Doha port Destination prepares to offer seamless tourist experience to over 50,000 passengers this season.With a large number of cruise passengers expected to arrive at the country’s ports, Qatar Tourism Authority (QTA), in co-ordination with the Ministry of Interior and Qatar Ports Management Company – Mwani Qatar, have announced new measures to facilitate their disembarkation and entry for a seamless tourism experience. In addition, QTA and the Ministry of Interior have confirmed that cruise passengers, due to the short duration of the stay, will be eligible for transit visas, which will further ease their entry into the country. According to Hassan Al Ibrahim, Chief Tourism Development Officer at QTA, the new procedures have been introduced in anticipation of significant increases in the number of cruise passengers. While Qatar has previously welcomed smaller ships carrying less than a thousand passengers, the coming season will be the first to witness the arrival of larger ships with over 1,500 passengers on board. The MSC Fantasia will be the first “mega-ship” to arrive in Qatar. It will dock in December with an expected 3,900 passengers and 1,500 crew-members on board. Destination prepares to offer seamless tourist experience to over 50,000 passengers this season. Thirty-two ships carrying over 50,000 passengers are expected to arrive in Qatar this cruise season, which continues until April 2017. 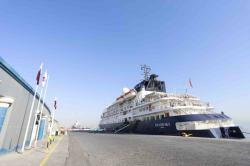 The first ship of the season is expected to dock on October 18th at the Doha Port in the heart of Qatar’s capital. Meanwhile, QTA is continuing to work with destination management companies and tour guides to ensure cruise passengers receive a warm welcome and enjoy an authentic Qatari experience during their stays. Tour guides have received intensive training on the management of large tour groups and effective communications about the destination. All visas are approved and issued at the sole discretion of Qatar’s Ministry of Interior.